Reading with my son is one of our favorite ways to spend time together. Whether we are enjoying a fun morning story to start our day or a bedtime tale to wind things down, there's always time for a good book. Just recently we've been introduced to a new series of books that offers a neat twist on how we do storytime. They're called Kidioke! Did that just make you think of the work "karaoke"? If so, then you are on the right track to guessing that these books have something to do with music! Kidioke Media LLC was started by Brian Dwyre. He, his wife, and three children are life-long residents of Morris County, NJ. Born from a family of entrepreneurs Brian set out to create something of his own. Growing up with loving parents and siblings, Brian would take the constructs of his childhood and mimic that with his own children. As a child his father would sing to him “Sweet Baby James” by James Taylor and “Mama Don’t Let Your Babies Grow Up to Be Cowboys” by Willie Nelson every night at bedtime. Those are some of the fondest memories he had with his father and it’s a tradition he wanted to continue. He began singing these songs like his father before him and before long would get requests from his children every night. With three children under the age of four he was constantly asked for two things at bedtime: Read me a book & sing me a song. Kidioke Sound Books encompasses both. So after hiring an attorney and countless months of negotiations, the rights were obtained and Kidioke was born. 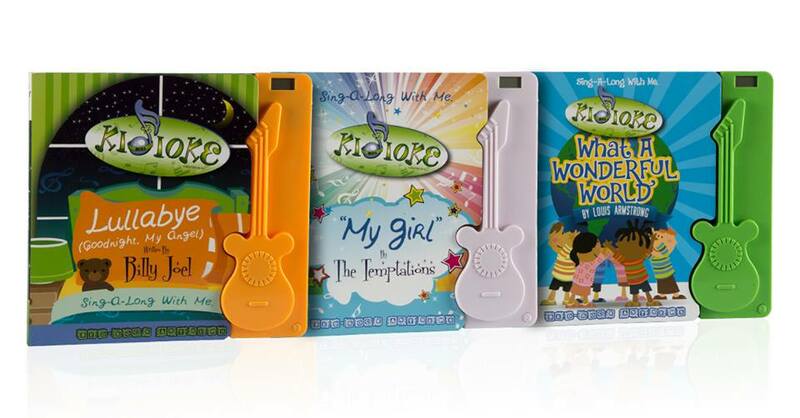 Kidioke books are based off of classic songs that many parents already love and want to share with their own children. Each story is actually made up of the lyrics to a song, but there's something even cooler about these books that sets them apart from others. You see, not only can children read along to timeless musical treasures, but they can also listen to the song as they turn each page. That's because Kidioke books have a built in music player to help bring each book to life. After seeing What a Wonderful World as a book choice, there was no question as to which one I wanted to get for my son. I've always been a fan of the song, but my love grew for it even more after he was born. Ever since he was a newborn, we'd snuggle up listing to Israel Kamakawiwoʻole's mix of Somewhere over the Rainbow/What a Wonderful World. Up until today, it's still his favorite song. Just last year, I introduced him to the Louie Armstrong version, and he enjoyed it just as much. It really is a heartwarming song that always puts a smile on our faces. The music is also completely optional, so if your child would prefer to quietly flip through the pages, they can just make sure the power is switched off. There's even a pause button just in case they need a break in between pages. The only thing I wish it did have is a volume switch, so we can lower the music if desired. This would be especially helpful while reading this right before bed, since I prefer to keep the decibel levels low as we begin to wind things down at night. With Kidioke books, not only can children read the lyrics like a story while listening to the actual song, but there's also a timer that helps them know when a particular verse of the song is coming up. Each line of text in the book beings with a number to let kids know what time that verse is going to be sung. For example, right at 38 seconds, the verse, "And clouds of white." comes in and at 42 seconds, "The bight blessed day." follows. 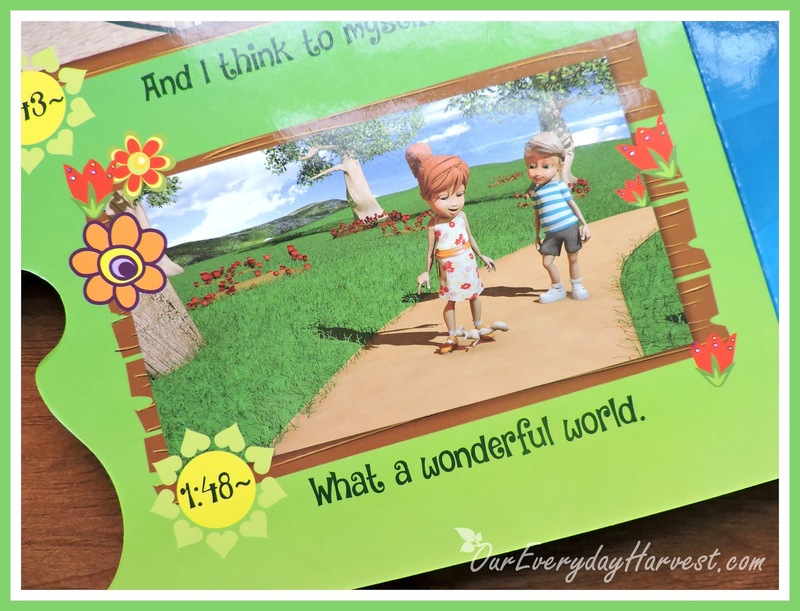 Each Kidioke Sound Book comes with sturdy board book pages, which are perfect for the youngest of children. Parents won't have to worry about little hands tearing or ripping the pages. In the What a Wonderful World version, there are plenty of fun CG illustrations that show people of all ages (both young and old) enjoying the day with their friends and family. The pictures definitely go with this uplifting, feel-good song. My son has become quite intrigued by his book, especially when the music is turned on. I think he's amazed with the fact that one of his favorite songs is playing out of it. As an adult, I'm even having some fun flipping through it, myself! If you're looking for a neat holiday gift idea for the kiddies in your life, then I definitely recommend checking out Kidioke Sound Books. Right now, they are offering free shipping on all book orders (both on Amazon and in their online store)! Smartphone users, can also try the Kidioke App that includes animated videos of timeless classics, along with a fun interactive audio/visual experience for kids. For more information, be sure to check out Kidioke and connect with them on social media!